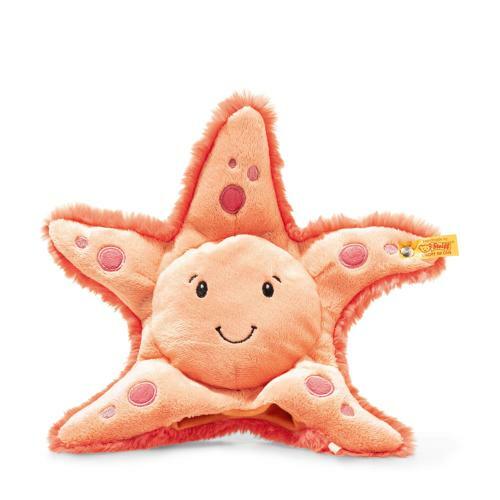 Starry sea star measures 27 cm and is made of wonderfully soft cuddly plush fabric. Its beautiful coral-coloured body is decorated with pink spots, some of which have embroidered edges. The eyes and smiling mouth are embroidered in black stitching. The face and arms are made of short plush fabric. The back of the starfish is made of long plush fabric. Bean bags are sewn into the ends of the two lower star legs. The opening in the belly can be used to turn the sea star into a hand puppet in an instant.